Published: Aug. 22, 2011 at 09:19 p.m. Updated: Aug. 16, 2012 at 02:32 p.m. 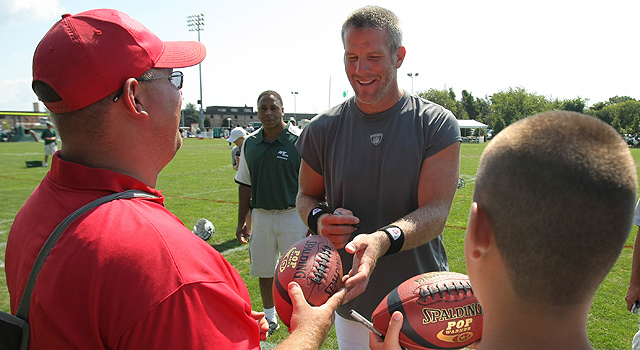 Wait, is that the real Brett Favre signing autographs? Or is it an imposter? There was a Brett Favre impersonator roaming around Green Bay this weekend, and the social media world was aflutter with jokes about crocks, fake retirements and cell phone photos. And it was all hilarious. But why would somebody choose to impersonate Favre? Especially in Green Bay? The only place Favre is likely less popular is probably Minnesota or New York. Favre is about as welcome in Green Bay as Nevin Shapiro would be welcomed in Miami. But that got me thinking (and I know you all hate that) what would be the worst situation for an impersonator to walk into? Here are my six choices. Remember the shenanigans around LeBron James and "The Decision?" Yeah, that was not enough to knock Modell off the list of "most hated in Cleveland." So yes, you should probably not go to any Cleveland restaurants to sign autographs as Modell. Speaking of Cleveland, any would-be Elway impersonators should stay out of Cleveland and he should also stay out of Baltimore, too. And if you think about it, if Elway does not burn Baltimore, imagine that the Colts stay there, which means that Modell would not have any place to go which means Elway killed Cleveland both on and off the field. The Bengals organization is not fond of Carson Palmer, who is currently retired from football. How mad are the Bengals? They do not want to play anybody who even resembles Palmer -- just ask his brother, Jordan Palmer. In case the name Walt Coleman does not jump out at you, remember that Coleman was the referee who made the infamous "Tuck Rule" call in the 2001 AFC Divisional Playoff Game. So yes, all of you Walt Coleman impersonators stay out of Oakland. There is likely some sentiment that Eli Manning impersonators should stay out of San Diego -- and they should -- but Leaf might be way worse. Because Leaf apparently wanted to play in San Diego, the only problem was that he was not very good at it. If any of you Terrelle Pryor impersonators think that you can trade in some jerseys for tattoos, you had better make sure that you do not do it Columbus. To quote some famous comedian, that is way "Too soon." There is not an NFL city that would welcome an Adam Rank impersonator. But you can hit him up via Twitter or via Facebook. Be sure to catch the latest on the Dave Dameshek Football Program.